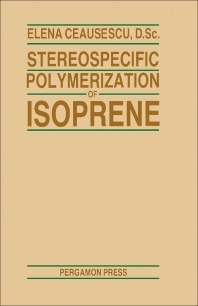 Stereospecific Polymerization of Isoprene, a doctoral dissertation by Dr. Elena Ceausescu, is a study of the synthesis of cis-l, 4-polyisoprene rubber, an elastomer of synthetic rubber whose structure and properties are similar to that of natural rubber. This elastomer is primarily used in the manufacture of tires, belts, hoses, matting, flooring, dampeners, and other synthetic rubber goods. The book is organized into two parts. Part I, the Ph.D. thesis, focuses on the explanation and exposition of the polymerization reaction; properties of the polymer; and certain theoretical aspects related to the polymer’s reaction mechanism and kinetics. Part II presents data derived from an extensive variety of experiments and tests intended to serve as a basis for the industrial production of cis-l, 4-polyisoprene rubber. The text will be an interesting book for materials engineers, industrial engineers, chemists, and science students engaged in the study of polymers.